How does CarePlus™ solve major healthcare issues today? There are many emerging trends in the healthcare environment that are affecting clinicians, caregivers, hospital management, the executive, and patients. In the current healthcare market the most crucial issues and trends include improving alarm management to reduce alarm fatigue, improving patient satisfaction with their care experience, and the introduction of mobile communication. Hospitals and acute care facilities are loud and action filled environments. A large part of this comes from the various alarms that are generated from medical devices and equipment. 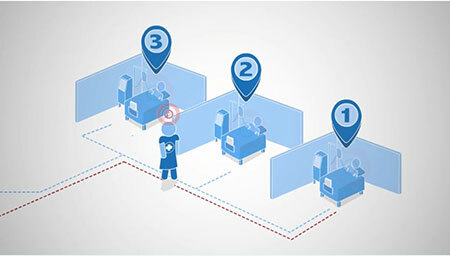 In units such as Intensive Care, Emergency, and Cardiac patients may be connected to dozens of different devices – all alerting caregivers to different events and changes in a patient’s condition. These medical alarms can make the difference between timely and lifesaving interventions, or serious injury and death. Due to the importance and sheer volume of alarms, it is crucial that there are alarm management procedures in place. According to the Joint Commission, there can be hundreds of alarm signals per patient per day. Within a hospital unit or ward this results in thousands of alarms, and tens of thousands throughout a whole hospital. It is estimated that anywhere between 85 – 99% of these alarms don’t require any clinical intervention. An excessive number of alarms, particularly for conditions that aren’t clinically significant, may induce alarm fatigue. Alarm fatigue is a growing trend in healthcare, with clinicians becoming desensitised, overwhelmed or immune to the sound of alarms. Clinicians may turn down the volume on alarms, turn off alarms or adjust alarm settings in an attempt to reduce the noise level within the healthcare environment – this practice can cause serious or even fatal consequences. Healthcare and technology research bodies have been collecting evidence on alarm management and alarm fatigue for many years, their continued research into this issue has seen worrying results. In 2014 several large healthcare organisations have announced alarm management as their top concern, and several initiatives have begun with the aim of reducing this issue. The Joint Commission announced that alarm management would be their National Patient Safety Goal for 2014. The US Food and Drug Administration’s (FDA) Manufacturer and User Facility Device Experience (MAUDE) database reveals that 566 alarm-related patient deaths were reported between January 2005 and June 2010, industry experts consider this figure to significantly under-represent the actual number of incidents. The ECRI Institute publishes the “Top 10 Health Technology Hazards” each year. This list is developed by the ECRI Institute’s Health Devices Group, highlighting the technology safety topics that need particular attention for the coming year. Some of these hazards regularly occur, others may become prevalent due to technology evolution, and some are well known risks that warrant renewed attention periodically. All are problems that can be avoided or are risks that can be minimised through careful management of technologies. Since 2007, the dangers related to alarm systems have been published by the ECRI Institute. Clinical alarm conditions have consistently appeared as the first or second most critical hazard on the Top 10 Health Technology Hazards. For 2012, 2013 and 2014 alarm hazards have been at the top of this list. These internationally significant bodies are all working on initiatives with healthcare facilities to make improvements to alarm management. All healthcare facilities are being encouraged to begin initiatives, programs and efforts to reduce alarm fatigue and alarm related incidents. The Joint Commission aims to introduce the second phase of their program by the beginning of 2016 that mitigates the risks associated with alarm management. The ECRI Institute is also offering free alarm management resources, to educate healthcare facilities on how to improve this issue. Patient satisfaction has always been an important component of the care offered by healthcare facilities. This is particularly true in private hospitals where hospitals run as businesses, competing for patients based on what they can provide, much like the model in the US. The trend of increasing private hospitals in other parts of the world, such as Australia, United Kingdom and Germany, also makes patient satisfaction an increasingly important part of what a hospital offers patients. The introduction of Obama Care into the United States has made the issue of patient satisfaction with their care experience increasingly important. Obama Care has introduced Hospital Consumer Assessment of Healthcare Providers and Systems (HCAHPS), the first national, standardised, publicly reported survey of patient’s perspectives of hospital care. This survey allows comparisons to be made across hospitals locally, regionally and nationally regarding a patient’s hospital experience. This is the first time that real and measurable comparisons have been able to be made between different healthcare facilities. For healthcare facilities, arguably the most important part of this new program is that patient’s responses directly affect the level of funding and rebates the healthcare facility may receive for a particular time period. HCAHPS is a 27-question survey sent to recently discharged patients, with 18 of the questions relating to critical aspects of a patient’s hospital experience. Healthcare facilities now have a bigger interest than ever, in ensuring that patients are satisfied with their level of care and their care environment. How does HCAHPS affect the rest of the world? According to some industry experts, the introduction of HCAHPS and the importance of patient feedback about their care experience may lead to the other countries introducing a similar system for their private hospitals. The level of government rebate for some hospital procedures in private hospitals may become dependent on patient feedback and their level of satisfaction with their care. Patient satisfaction is already a key feature of the care provided by private healthcare facilities, ensuring that patients are satisfied with their care experience is what ensures that patients will return. How does HCAHPS relate to Nurse Call? In the 27-question survey received by patients, there are 2 questions that directly relate to the effectiveness of the nurse call system. Question 4 in this survey directly relates to nurse call response time, and patient satisfaction with this response. Question 9 in this survey relates to reducing the noise around patients, this draws directly from the issue of alarm management as discussed above. A quiet hospital and recovery area promotes healing for patients. CarePlus™ can directly improve the timeliness of responding to nurse call alerts and assists with reducing noise levels within the hospital environment to promote patient healing. Smartphones are an ever increasing part of our daily lives. Today much of our lives are run through mobile communication platforms, whether it is through Smartphones or tablets. Since the introduction of this smart technology, the question of its place in the healthcare environment has been discussed. As popularity of this technology continues to rise, so does the push to implement mobile communication into all aspects of healthcare. Smart devices are designed to facilitate mobility, providing a solution to the outdated work practices around having fixed workstations (up to 8% of a clinician’s time per day is wasted commuting to and from their workstation). These devices allow clinicians to continue caring for patients, rather than spending time on find, fetch, retrieve. The Dance of the Call Bells  as described by Dr Lyn Deitrect et al. is solved through mobile communication and smart devices. Nurses are no longer required to go back and forward to the nurse station as communication is directed to their device, and contact with other departments and staff is able to occur in immediate real-time. A study using wireless communication integrated into the hospital’s nurse call system  found that nurse’s response time to patient calls or requests improved by 51% when using a wireless mobile communication device. This directly corresponds to the HCAHPS requirements of a timely response to nurse call requests. The trend in acute and aged care environments is to improve the ‘look and feel’ of the environment. The push for these healthcare facilities to look less like hospitals and more like homes or hotels is driving the mobile communication trend. Using smart devices to alert clinicians and caregivers to nurse call alarms, and other hospital alerts removes the need for audible alarms and flashing lights as staff are alerted to alarms in immediate real-time. As clinicians receive the communication in immediate real-time and are able to choose an appropriate response to the alert, there is improved communication with patients. The ease of communication between caregivers and patients, between members of hospital staff, and the reduction in noise level improves patient satisfaction exponentially. How does CarePlus™ improve these issues? CarePlus™ improves alarm management procedures by ensuring that the correct/assigned caregiver is notified of alarms, ensuring that alarms do not need to be broadcast, and automatically escalating alarms if not responded to within a variable threshold depending on patient acuity. CarePlus™ decreases alarm broadcasting, reducing the likelihood of alarm fatigue for clinicians and caregivers. CarePlus™ is also able to promote a quieter hospital environment for patient recovery and improves response time to nurse call alarms through their integration to smart devices. CarePlus™ Mobile Connect also allows for more advanced alarm management. This CarePlus™ feature allows messages and alarms to be sent directly to a caregiver’s Smartphone or tablet. Alarms and messages no longer need to be broadcast, as they are sent directly to the assigned clinician. The CarePlus™ Mobile Connect application allows clinicians and caregivers to respond to patient alerts in several different ways, all of which work to improve clinician workflow and efficiency. Accept a patient alarm to attend the call immediately. Reject a patient alarm if they are not available to respond to it in a timely manner. Rejection of an alert allows for Auto-Escalation to take place, where an alarm can be escalated to a preassigned alternative individual or group of caregivers. 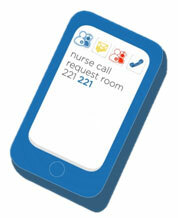 Caregivers may also Call-Back a patient’s bedside telephone so that direct communication may occur. This improves communication with patients, and allows for clinicians to better prioritise their workflow and tasks. To learn more about CarePlus™ Mobile Connect, click here.